Whether you prefer them traditionally made, or prepared with a unique twist, open faced tuna melt sandwiches are easily customized so everyone can enjoy them! 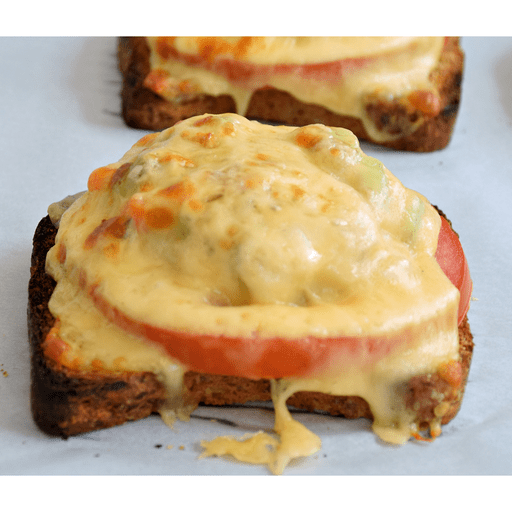 Toasty whole grain bread layered with thick, juicy tomato slices, heart-healthy tuna and your favorite melted cheese make a fun and satisfying snack or lunch. 1. Lightly toast each slice of bread. 1. While bread is toasting, combine tuna, celery, carrots, onion, mayonnaise, vinegar, salt and pepper in a medium bowl. 1. Place the toasted bread on a baking sheet. Place the tomato slices on top of the bread and distribute the tuna salad on top of the tomato. Place a slice of cheese on top of the tuna. 1. Place the baking sheet under the broiler on high for 3-4 minutes until the sandwich is hot and the cheese is melted. Serve warm. For gluten free: Use gluten free bread in place of whole grain bread. Per Serving: Calories 270, Total Fat 11g (Saturated 4.5g, Trans 0g), Cholesterol 65mg, Sodium 690mg, Total Carbohydrate 14g (Dietary Fiber 3g, Sugars 3g), Protein 28g, Vitamin A 30%, Vitamin C 8%, Calcium 20%, Iron 4% *Nutritional values are an approximation. Actual nutritional values may vary due to preparation techniques, variations related to suppliers, regional and seasonal differences, or rounding.